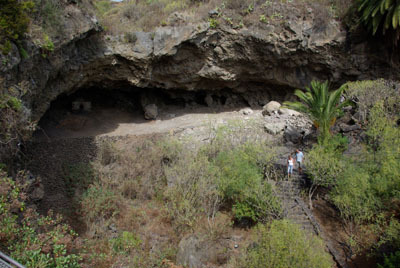 Before the Spanish invasion, Belmaco Cave was the home of the kings of Mazo. 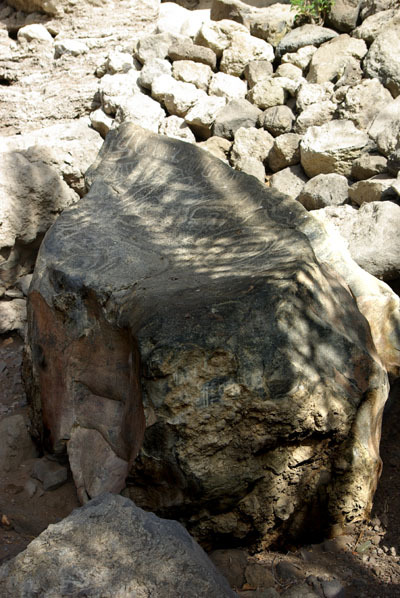 The first rock carvings were found in the 18th century, which was the start of archaeology in the Canary Islands. Today, it’s open to the public. The entrance where you pay (€1.50 for a resident adult) is also a handicraft shop. A little farther inside, there’s a small, two-story building housing various artefacts, like shell spoons and bone punches, and lots of ceramics. Ceramics survive better than leather work, after all. After that you follow the path under the road to the main cave, with its rock carvings. By the way, that little square construction inside the cave is much more recent. It’s an oven for drying figs. There’s a path around the site, with nine more small caves and display boards explaining things like which kind of tree is in front of you, and what it used to be used for. It’s a nice stroll of about a kilometre, but in some places the paths are steep and rough, so it’s not suitable if you have serious trouble walking. There’s a legend associated with the cave. The old canton of Tigalate (now Mazo) was ruled by two brothers, Juguiro and Garehagua. Their sister, Arecida, was beautiful and charming, and she fell in love with a brave and handsome warrior called Tinamarcín. Of course princesses couldn’t usually marry for love, but her brothers thought well of Tinamarcín too, and so they started to prepare for the wedding of the year. All the island’s royalty was expected to come. And then Guillen Peraza arrived at the head of a party of would-be invaders. Luckily for the Benahoita, he was inexperienced, and they drove him off to La Gomera. Tinamarcín was particularly brave and skilful in the battle, and Arecida loved him more than ever. But Guillen Peraza came back just a few months later, and this time he brought people from La Gomera and El Hierro with him. They worked as interpreters,and fought alongside the Spanish. One of them, Jacomar from El Hierro, was dazzled by Arecida’s beauty. But he was a cruel man, and when he found that she would never give him her love, he tried to take it by force. She resisted him, and he murdered her with his knife. Tinamarcín swore vengance, but Juguiro and Garehagua got to Jacomar first. They killed him and left his body for the vultures, and Tinamarcín was left with nothing more than memories of his love. The cave is on the lower road from Mazo towards Fuencaliente, at km 7, near Lomo Oscuro. It opens Monday – Saturday 10:00 am – 18:00 pm and Sundays 10:00 am – 14:00 pm, Tel. / Fax: 922.44.00.90 (but I’m not sure how well they speak English). They have a website in Spanish here with a map. Did you know that I have a Google map for La Palma? 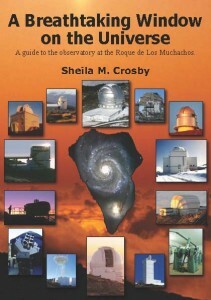 Go to http://maps.google.com/ and search for “la palma canary islands”. So far, I’ve marked 24 places of interest.